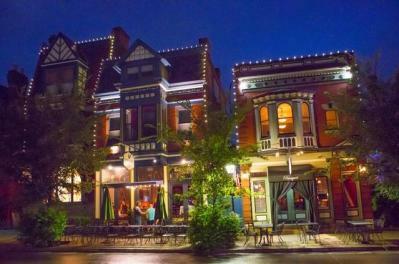 Listed on the National Register of Historic Places in 1971, the area of Covington known as the Licking Riverside Historic District is recognized among the premier historic districts in Greater Cincinnati. The district includes historic Riverside Drive, where the first Europeans to set foot in Covington likely did so at what was known to pioneers as “The Point,” where the Ohio and Licking rivers — and now the cities of Covington, Newport and Cincinnati — all meet. Prior to the city of Covington’s founding, George Rogers Clark used this area as a mustering spot to defend against Indian incursions, and later for organizing troops for his campaigns. The Daniel Carter Beard Boyhood Home, a National Historic Landmark built in 1821 and one of the two oldest buildings in Kenton County, was the childhood home of the founder of the Boy Scouts of America. The 1815 Thomas Carneal House, a grand Georgian-style home which, as part of the Underground Railroad, still features a tunnel to the Licking River through which the owners helped slaves escape to the north. Among its prominent visitors were the Marquis de Lafayette, Henry Clay, Andrew Jackson and Daniel Webster. The Grant House, a Greek Revival Mansard-roofed double house once owned by Jesse Root Grant and Hannah Simpson Grant, the parents of U.S. President Ulysses S. Grant. The private school his children later attended, the Clayton School, was built in 1839 reusing boat timbers and still stands just three houses south of the Grant House. 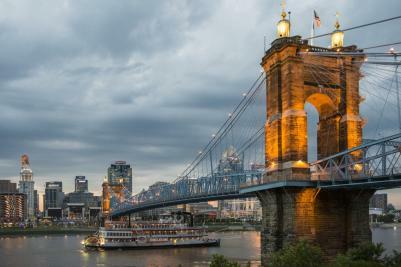 TIP: Don&apos;t miss out on the Roebling Murals and use the Southbank Shuttle or Cincy Red Bikes to easily connect between Covington, Newport and Cincinnati. 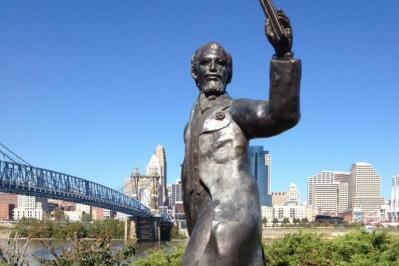 While John Roebling may be best known for New York’s famed Brooklyn Bridge, his groundbreaking design for this stately signature spanning the Ohio River was completed nearly 30 years earlier. Though its completion was delayed by the Civil War, it opened Dec. 1, 1866, as the longest suspension bridge in the world at 1,057 feet, and the first to utilize both vertical suspenders and diagonal stays fanning from either tower. Placed on the National Register of Historic Places in 1975, it remains a busy span for transportation, a distinctive pedestrian connector and a beloved subject of photographers. Erected in 1852 and in continuous operation since 1855, Findlay Market is one of the oldest surviving municipal market houses in the U.S. Listed on the National Register of Historic Places in 1972, the structure was among the first markets in the United States to use iron frame construction technology and among just a few that have survived. 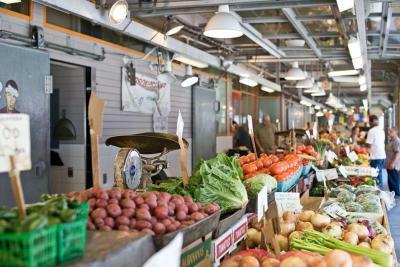 Today, the Market hosts over one million visitors per year, dependably abuzz with the region’s most socially, economically, racially and ethnically diverse crowds. Over 150 years after its opening, Findlay remains a true regional institution, as well as a continually evolving, quintessentially unique urban shopping experience. Located in the burgeoning Over-the-Rhine historic district just blocks from downtown Cincinnati, Findlay Market is home to dozens of indoor merchants selling meat, fish, poultry, cheese, produce, flowers, and ethnic foods — and surrounded by a wildly eclectic array of shops, delis and restaurants housed in restored 19th century buildings. On weekends from April through November a thriving open-air farmers’ market features dozens more local vendors offering fresh produce, specialty foods and handmade crafts, along with street performers and regular special events including musicians in the OTR Biergarten. Open year-round, Tuesday through Sunday. Named one of “The Most Beautiful Churches in the World” by the Catholic Reporter, the Cathedral Basilica of the Assumption is a stunningly ornate Gothic Revival achievement that draws attention and visitors from all over the world. Planned and built over a 30-year span from 1885 to 1915, it is a remarkable paean to 13th century French-Gothic style, with an interior modeled after the Abbey Church of St. Denis in Paris and a facade designed to mirror Notre Dame de Paris. 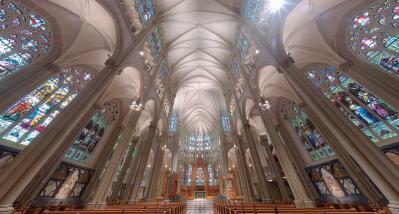 Among its interior appointments are 82 hand-poured stained glass windows crafted in Munich Germany — including one of the largest in the world, the 24- by 67-foot splendor that graces the north transept — and two massive rose windows, each 26 feet in diameter, modeled after those in Notre Dame Cathedral. In this soaring, awe-inspiring structure, visitors will also find three pipe organs, murals by Covington native Frank Duveneck, and its signature Stations of the Cross, each an immense mosaic masterpiece containing more than 70,000 pieces of Italian tile. Outside, 26 sensational gargoyles, each hand-carved in Italy, ring the exterior and watch over the grounds. On Dec. 8, 1953, Pope Pius XII elevated St. Mary’s Cathedral to the rank of minor basilica, one of only 35 in the U.S.
Covington’s crown jewel, Mainstrasse Village is a National Register Historic District conceived in the 1970s as a restored 19th century German village. Blocks of well-preserved and renovated buildings are home to both adventurous urban dwellers and a charming array of shops, boutiques, restaurants and cafes. The charming, tree-lined Sixth Street Promenade includes the towering bronze Goose Girl Fountain inspired by the Brothers Grimm fairy tale — and is the time-honored location for numerous annual festivals including Maifest, Oktoberfest and Goetta Fest, a freewheeling homage to the region’s ubiquitous German meat and pin oat staple. In Goebel Park, the beautiful glockenspiel Carroll Chimes Bell Tower features four illuminated clock faces and 43 bells.